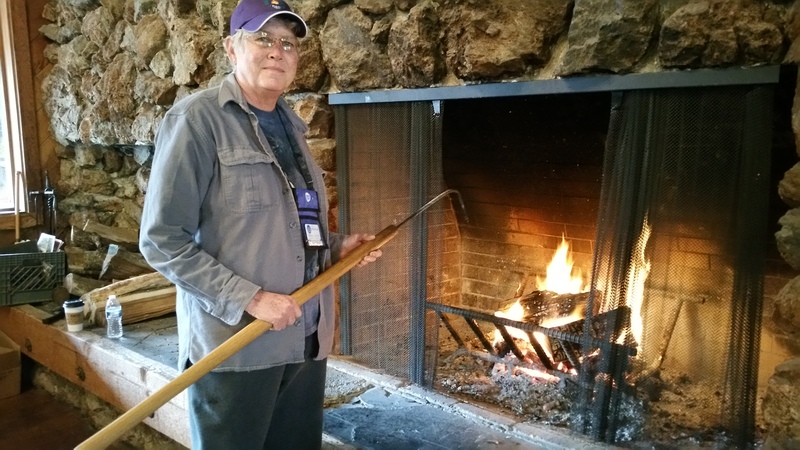 A roaring, warm fire in the huge fireplace was tended by Shelly and Linda for 4 days…thanks! 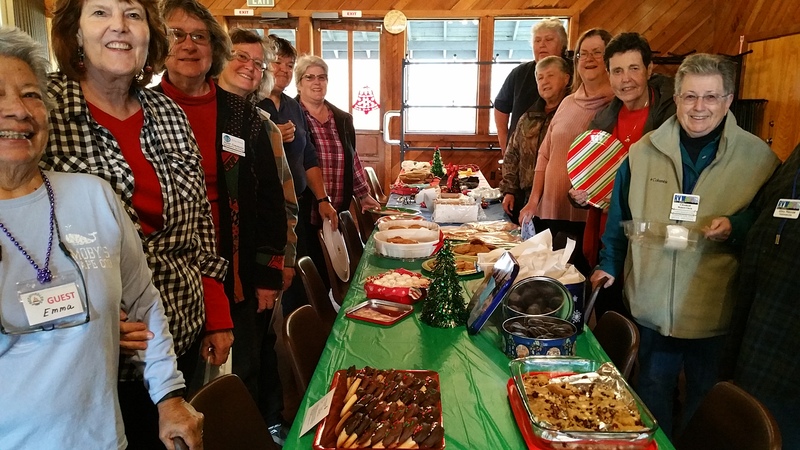 Many ladies arrived on Thursday and after visiting with friends, old and new, everyone decided it was time to begin the “Eating Frenzy!”. 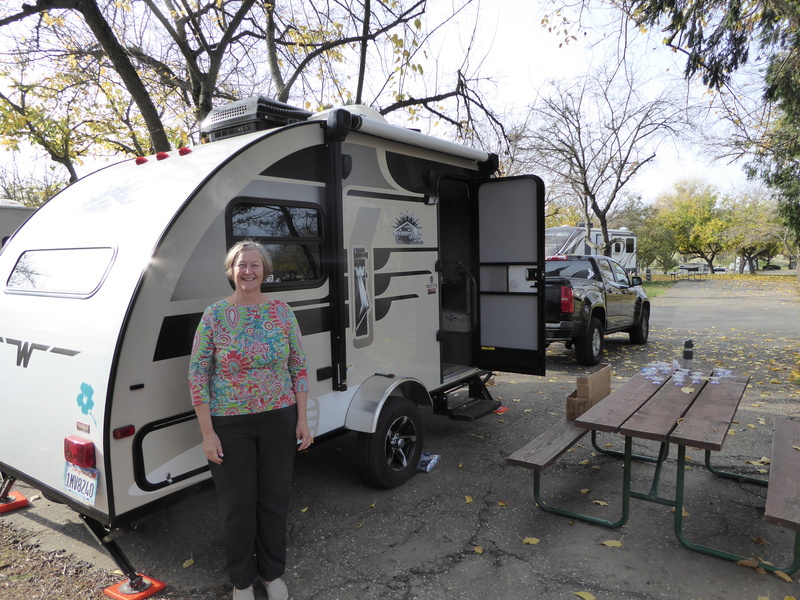 Some went to “downtown” Plymouth to eat at Taste, some stayed at the RV park, and many went to the Mexican restaurant down highway 49. On Friday, the remaining ladies arrived! Everyone enjoyed having a nice relaxing day talking with each other, taking walks with dogs, playing games, and/or decorating their rigs with lights and Christmas decorations. The Meet and Greet Potluck Friday evening was much fun with eating wonderful appetizers and meeting some wild ‘n crazy new members and guests! 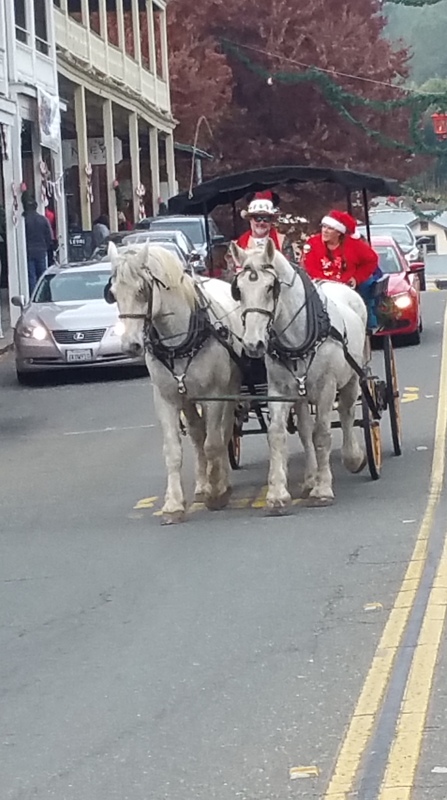 Many spent the day either at Sutter Creek’s Christmas Party, visiting Jackson or other places in the Gold Country, or relaxing. Finally, FINALLY, our world-famous Saturday night Christmas Dinner with so many delicious treats, from fresh baked ham, beef, veggies, wonderful salads…well, you name it…we had it!! 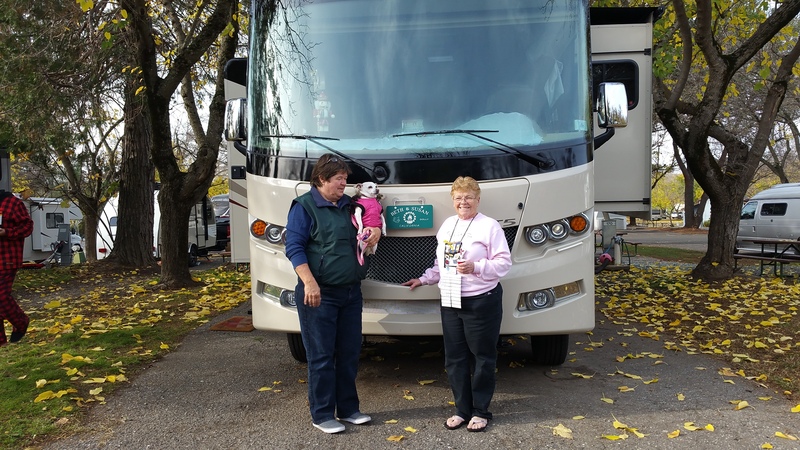 After dinner our rig decorating contest winners were announced…Mary and Kris received the most votes and won an RV-shaped cookie jar! 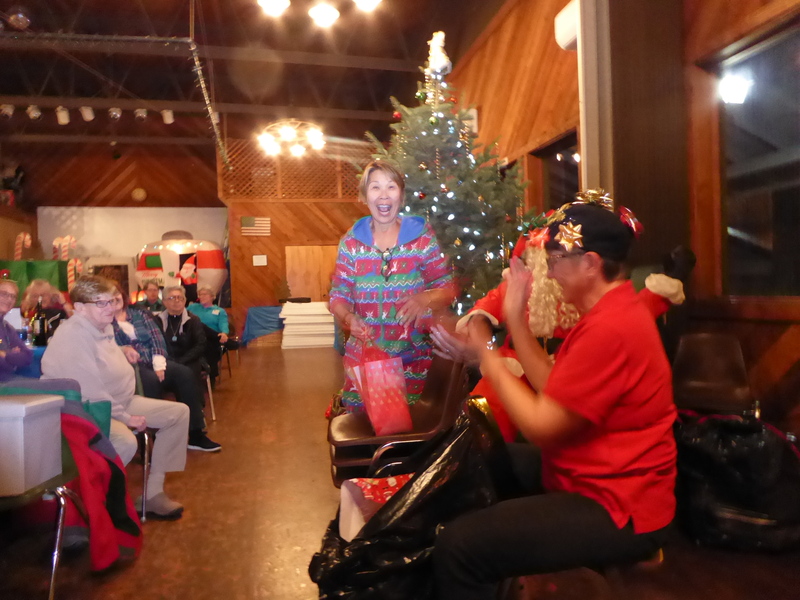 Our Freewheeler Strummers (ukuleles) led us in many fun Christmas songs, ending with an exciting12-days of Christmas! 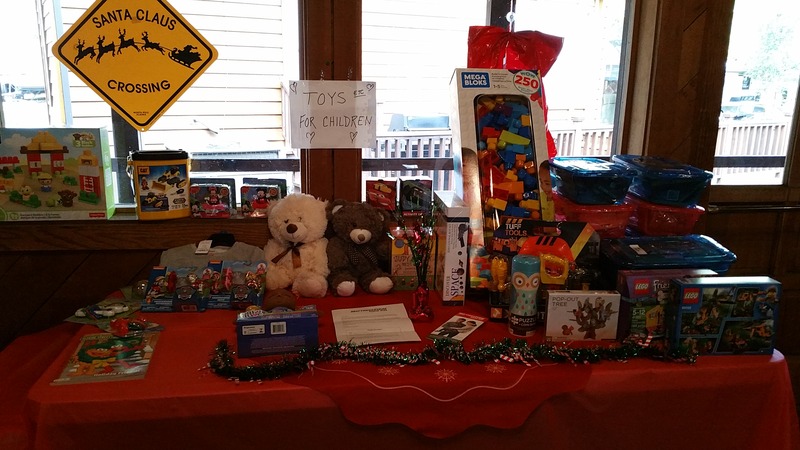 Our Christmas Party is never complete without the Christmas Gift Exchange! We had so much fun with a number of people having to return for another gift a few times as everyone wanted their gift!! There were lots of laughs! Sunday was the Clean out the Refrigerator Potluck Breakfast, then saw many leaving. Those who stayed played games, played music, sewed, read, walked, etc. Sunday evening, some returned to the Mexican restaurant or Taste, while others ate lightly to help their stomachs recover! We all had so much fun!! Plan on next December at 49er for the 2018 Christmas Party!! Wow! WILD 20th BIRDTHDAY BASH!!!!! An amazing weekend was held at Sugar Barge on the Delta Nov. 2-6, 2017. 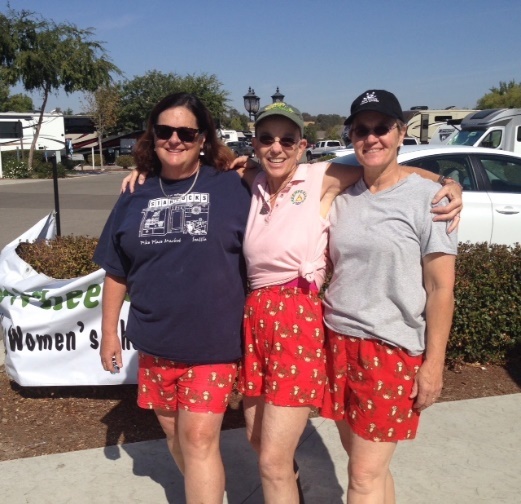 Sponsored by the FreeWheeler’s Board, a great time was had by all! Many arrived on Thursday and enjoyed some time of relaxation and then had a lovely dinner at the Rusty Porthole. Friday saw people relaxing, reading, playing board games, and in meetings! 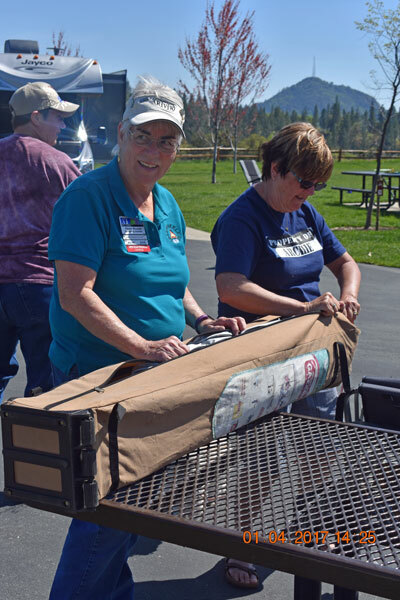 Friday evening was our traditional Meet and Greet where we greeted 37 duo FW friends, and 23 single FW friends, and special guests from Arizona (Maureen and Cathy) along with a few other guests and new members, for a total of 60 rigs on the Delta! 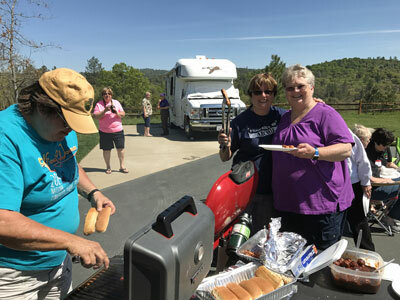 That evening was filled with plenty of appetizers, after which Sally Johnson and Sheila Welt gave us a brief history of RVW and FreeWheelers as part of our birthday bash celebration weekend. Rachel Harp then took the mike and gave a fun presentation full of laughs, new gadgets, and lots of questions. Saturday was a very busy day as we started with a great potluck breakfast and our annual meeting. Thank you to everyone for helping us keep it to under an hour!!!! 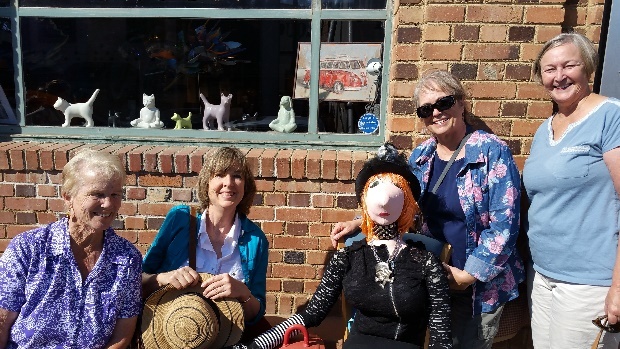 The new Board was voted on and announced.The time was filled in the afternoon with many people selling their crafts, wares, garage sale items, and jams, during which we were lovingly serenaded by the All Girl Band and the FreeWheeler’s Strummers! It was so great to see so many participants and everyone enjoying time together in the spirit of camaraderie! That evening was the “over the top” potluck dinner followed by the Birthday Bash Celebration. Laughs abound as people tried their hardest to Pin the Toad on the RV while others drove each other crazy in the Balloon Caterpillar game! But the CAKE (with Patti Patton and Sheila Welt as 20 year honorees) was by far the most important part of the evening it seems as people started chanting, “We want cake!” And they loved it! Prizes were given for the game winners as well as many door prizes and everyone went home happy that night. It was a really fun celebration. We are very pleased to announce also that in our Donations jar we received a total of $410 for the Sonoma Humane Society ($350 from Paso Robles), a total of $575 for the fire victims of Santa Rosa area, and $110 into our treasury. Sunday many had to say goodbye but those that stayed played games, read, and had more meetings. About 35-40 saw ourselves at the Grill on the Levee for a delicious dinner as we closed out a wonderful time of friendship. Well the second annual Paso Robles Rally started off with a rough start. Three weeks before the rally we had 19 rigs ready to go. However, between the Santa Rosa fires, a couple of gall bladder problems, a back surgery and broken arm, not to mention the normal family problems and rig problems we ended up with the minimum of 10 rigs and 14 ladies. There is something to be said for a small group. About half the group that made it were repeats from last year. Because it was a small group we were able to get to know everyone so much more. It was a great weekend and we all had a great time. Like last year the weekend started off with some early arrivals on Thursday night where some of us headed into San Luis Obispo for the widely known SLO Farmers Market and like last year we didn’t make it half a block before we all got food. As always the Cowboy Cookie bowl and ice cream was a great end to the meal for some of us. Friday evening the resort puts on a small wine tasting with a few vendors for the whole park and of course money did change hands for some very interesting drink mixes, pet toys and other items. 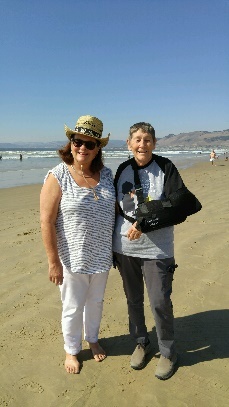 From there we went on to the Meet and Greet where we had a new member Patricia Stearns join our group. 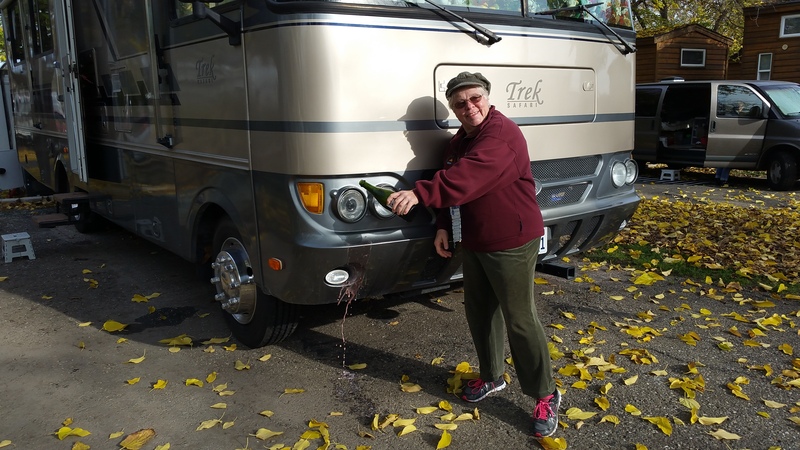 Welcome Pat, she is a great addition to the FreeWheelers. Saturday morning after breakfast the owner of Howell’n Good Doggie Dental came in and did a talk and a demo on cleaning dogs teeth. Not only did she cover the importance of doing so but how it can be done without anesthesia. Thank you to Charmain Howell, Morgan Doolin and demo dog, Doberman, Shenzi. Everyone, including those without dogs were very impressed with the presentation and of course with Shenzi. 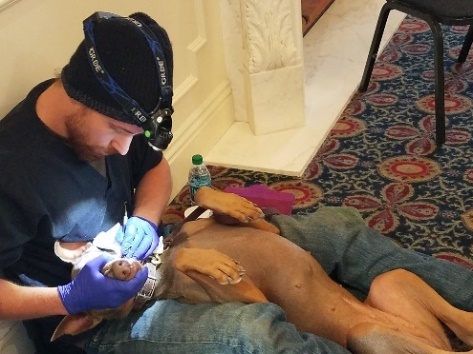 Charmain even offered to come back next year and set up a special price for those interested in having their dog’s teeth done. 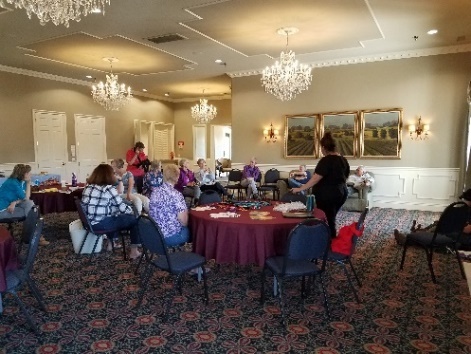 We also had a round robin that morning getting everyone’s ideas of what they do to get ready for or on one of their trips that others might want to do and some of the ideas were super. The rest of the weekend had folks going out to the beach and some of the small towns from Pismo Beach to Cambria, where they were having their annual Scarecrow contest. 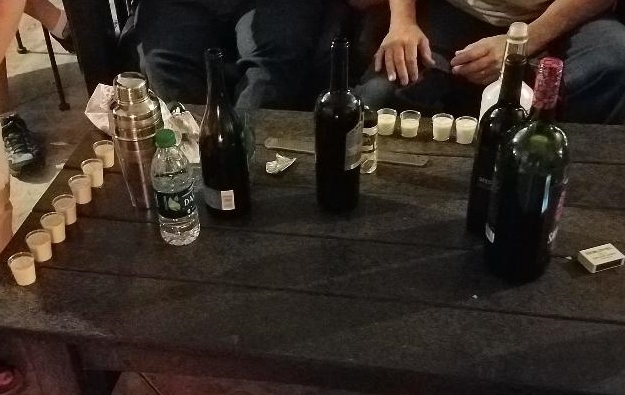 Of course there was a little wine tasting going on as well. As always the food and the comradery were great. 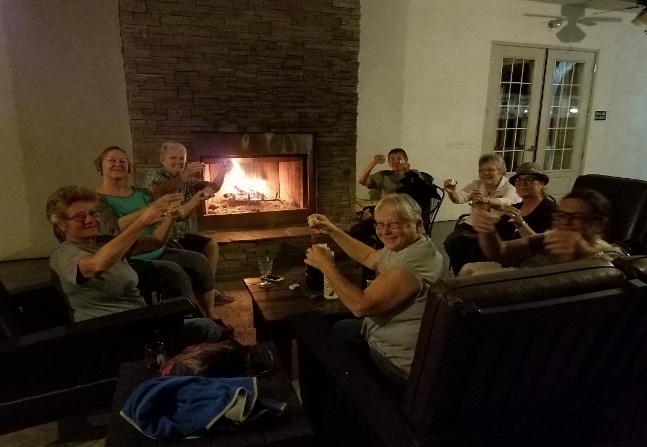 Every evening we shared wine and beer around a beautiful fire on the deck by the clubhouse. The last night we even had a taste test between two drinks; a Pumpkin Martini and Pennsylvania Dutch Eggnog. It was a tie. Some just hung at the rigs and relaxed, read or played games. Some of the gals had a great guy by the name of Earl come and wash and wax their rigs. He did a super job. 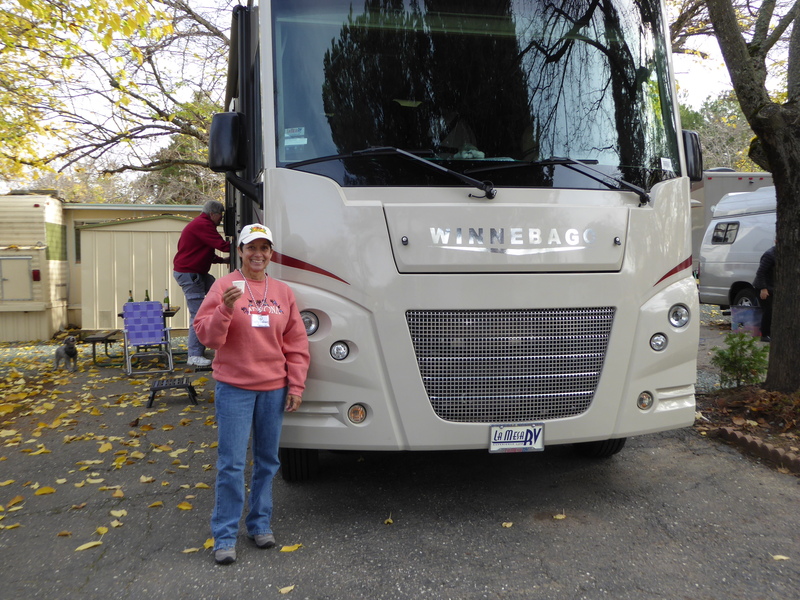 The Vines RV Resort was a beautiful place and the staff was awesome. They made sure that there was firewood available for us nightly and responded to any needs or requests that we had. They even have a bar and pool table. Needless to say everyone found something to do. We also put out a donation jar to collect money for The Sonoma County Humane Society, on behalf of RVW Free Wheelers, due to the fires in that area. For a small group of 14 gals we did pretty good, collecting $250. I want to thank all that came for making the outing a success. 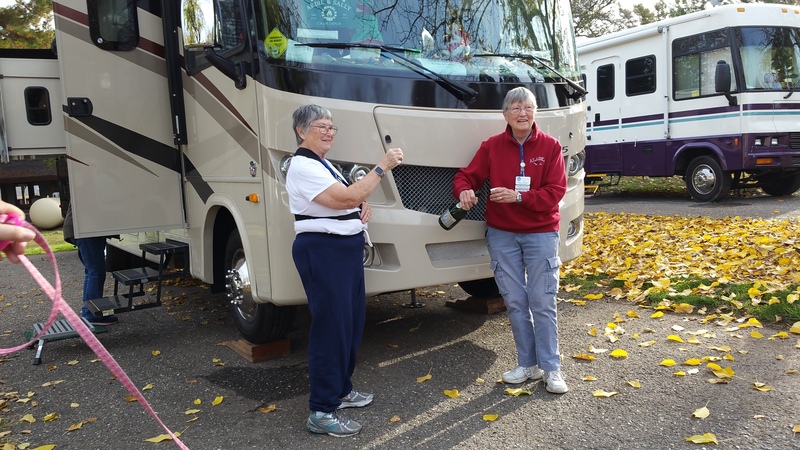 This is a beautiful RV Resort with flat cement parking spaces and a beautiful clubhouse, outdoor fireplace, heated pool, and Jacuzzi, all in a location with lots to do! Looking forward to doing this event again, so watch the Freewheeler events for next year’s date. We are also looking at changing things up a little with a new theme to the weekend, taking into account some of the things from this weekend. Stay tune. Last year was so much fun at Casini, that we did it again. 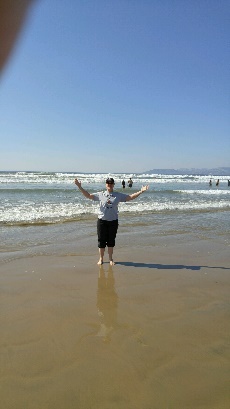 And it may have been even more fun this year! We kicked off the weekend on a balmy Thursday evening with a weenie roast campfire complete with s’mores. By Friday evening there were 59 members and 7 guests for the potluck Meet and Greet. We may have set a record as we introduced nineteen new members on their first outing. Our talented ukulele strummers (plus one banjo, one guitar and a bass ukulele) completed the program with a sing-a-long as well as some beautiful solo Irish Ballads. Saturday morning began with the usual enormous pot luck breakfast followed by a pet fashion parade. Thirteen dogs were dressed up in their finest outfits and together they took cuteness to a new level. Queen Mia took the prize for the most elegant and Oliver the Sailor Man won for both cutest and funniest. But everyone agreed that all the entries were winners. Next came the rig warmings with a range of sizes from the smallest that slept one person to the largest that had two bathrooms. At 5:45 on Saturday evening Martha called the group to dinner by playing the bagpipes on the patio. As she played, people from all over the campground came to hear her. 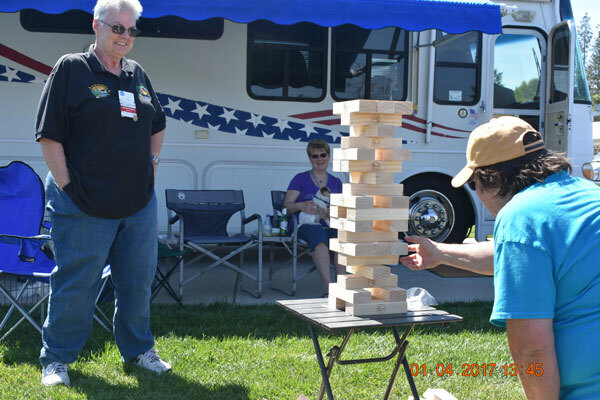 It was quite a sight and everyone, including the campground manager, hopes she plays again next year. The third annual “Everyone Has a Birthday” birthday party was held after the Saturday night potluck dinner. Last year we divided up by our astrological sign, so this year we each sat with everyone who shared our Chinese Zodiac animal. There was a quiz to find out who knew the most about the characteristics of their year. After the answers were shared, everyone learned who they are and are not compatible with, what their lucky and unlucky numbers and colors are, plus other things about their sign that they didn’t know existed. The winner from each group received chopsticks with their animal on them. Then the groups competed with each other by determining who could transfer 10 marbles from a slippery plate into a cup using chopsticks. Finally, each group had to make their animal out of Play-Dough resulting in twelve of the most creative sculptures imaginable. In keeping with the theme, the birthday cakes had Happy Birthday written in Chinese and everyone got a fortune cookie. Here are some of the fortunes we put into the cookies: Camping – Pretending you can live without modern conveniences; Never hike alone in bear country. Go with someone you can outrun; You don’t need therapy, you need to go camping more often; Always expect your RV repair to cost more than $1,000; No matter how much you love your RV, someday you’ll buy another; If you move to the other side of the campfire, the smoke will follow you; The RV parked closest to you will contain the noisiest children. (and 65 others!) The evening ended with “Bring a gift, Take a gift” and “Bring a card, Take a card” exchanges and hopefully no one felt a year older. The Russian River area offers so many things to do and we did most of them. While some kayaked, others hiked. One group went to see the giant redwoods in Armstrong Woods and other group visited the shops in Duncans Mills. 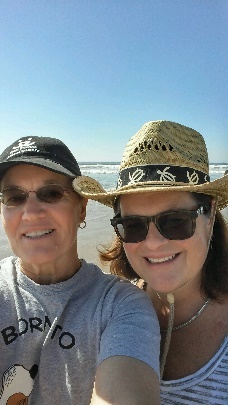 A few ladies played golf while a few more hung out at the beach. Some played games on the patio, while others relaxed and visited old friends. Sunday brunch at Cape Fear was popular again as was River’s End in Jenner for a delicious dinner and beautiful sunset over the ocean. If you agree that this is a great outing to attend, be sure to reserve September 13th to the 17th of 2018. And sign up early next year as it will fill up fast. March 30 to April 2nd: What a beautiful weekend in Jackson in-spite of the occasional wind gusts. We had approximately 83 wonderful women in attendance with 51 rigs. As seems to be the pattern many arrived on Thursday, set up their sites and started visiting. Friday found us decorating the clubhouse for our International weekend theme with multi colored tablecloths, flowers and containers decorated with world maps, filled with birdseed (to feed our feathered friends after the event) and with international flags. Friday night we had the meet and greet and amazing hors devours and introduced a new member and guests. Saturday morning was breakfast and rig warming for 3 new rigs and at noon we had a block party that included hot dogs and potato chips and games. 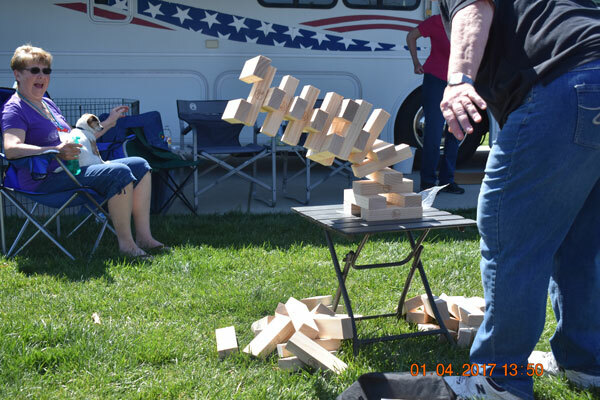 Beth Gilliam and Sue Copeland entertained us with their game of JENGA, this game was the large size and stood about 3 feet tall. Not that Beth and Sue are competitive. Some of the members played corn hole, ring toss, and bocce ball. It was a great way to involve new members and guests. There was a great turn out and in typical FreeWheeler fashion a number of women helped to clean everything up. Saturday night was the International Potluck and the ladies out did themselves as at least 7 countries were represented. 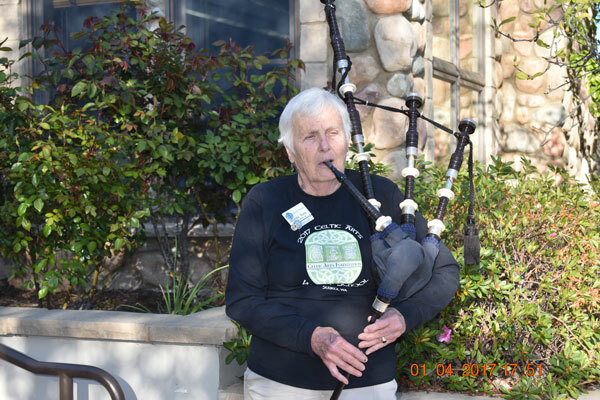 A wonderful surprise was Martha standing at the steps of the clubhouse and ushering us in by playing the bagpipes. 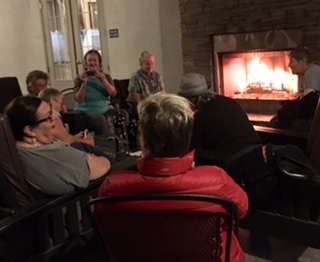 What a great way to start the evening , even the casino shuttle stopped to listen, as did many of the other folks staying there. After filling up on foods like German potato salad, corn beef and cabbage, pasta, Hungarian stew……. we were entertained by our resident musicians with the evening topped off with Shirley and Donna swing dancing. A number of us watched the women’s NCAA basketball final four and were sad to see Stanford lose and thrilled that Mississippi State beat undefeated U Conn. Go underdogs. Sunday morning was the clean out the fridge breakfast and clean up. A number of women stayed over to further enjoy the sunny weather. It was a great weekend to re-connect and to re-energize.